Ray Bradbury's pretty swell, I like him a lot. 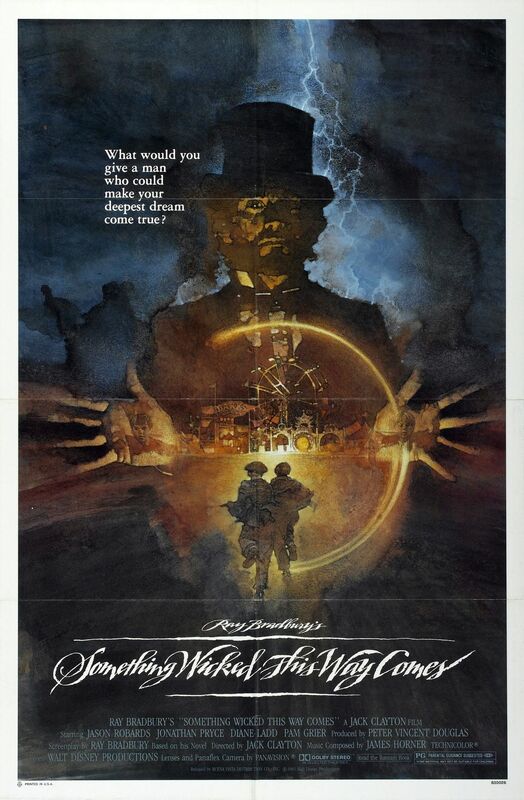 So when I discovered that there's a film adaptation of his dark-ish novel Something Wicked This Way Comes, I figured I should check it out. I was also intrigued by the concept of a kids' horror movie. Longtime readers will remember when I watched Poltergeist and found it a bizarre combination of Spielbergian family film and gory Texas Chainsaw Massacre splatter. So is there a way to make a horror movie for kids without compromising the scary necessities of the genre? 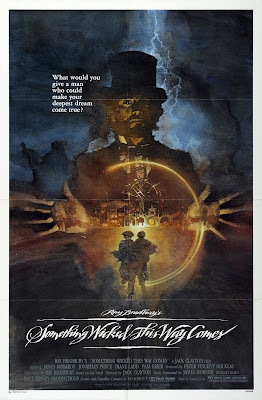 Taking Bradbury's own small town Illinois upbringing as an inspiration, Something Wicked tells the story of two young friends, Will and Jim, who are more than excited when the carnival comes to town. However, the carnival's proprietor Mr. Dark (Jonathan Pryce!) who claims to make dreams come true actually has much more nefarious purposes for coming to town, such as binding the townsfolk to serve him forever. This is probably a movie I would have been really into as a kid: I'm a sucker for stories about boys going on adventures and escaping peril. But supposed offscreen conflicts about the film's tone and direction seem to have sabotaged the movie. Even by little kid standards, besides a swarm of spiders there's nothing too threatening here. Bradbury apparently wanted a much darker film but Disney wanted something more family friendly and therefore more bankable, although they claimed to be trying to get away from their reputation as an animation house for children. In the end we have a enjoyable film on our hands, but not something all that special. But was it scary? I'm not sure what scares children, but I feel as though one would have to be pretty sheltered for this to legitimately freak them out. Though there's plenty of whimsy and derring-do to make it a good time.